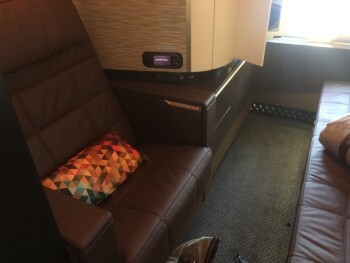 Etihad A380 First Class Apartment reviewed! 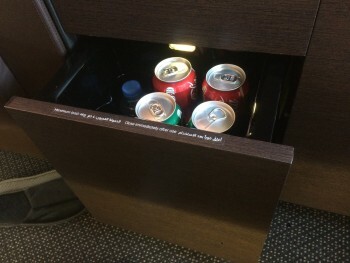 This is part 2 of my review of my recent Middle East trip, which started with a visit to the Plaza Premium Lounge in Terminal 4 and a (not reviewed) revisit to the Etihad lounge. This article is my review of the First Class Apartment on the Etihad A380, flying from London Heathrow to Abu Dhabi. 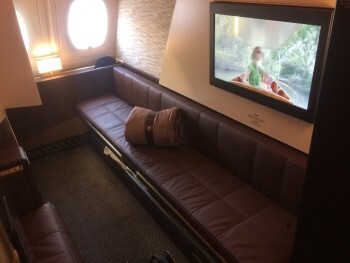 This is a totally different product to the standard First Class Suite on the Etihad Boeing 777 aircraft which I reviewed earlier in the year. 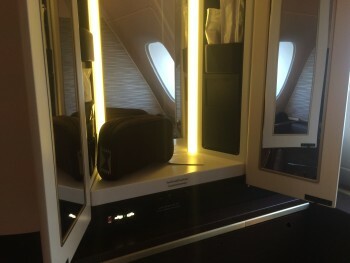 I struggled to choose between the First Class Suite on the 777 and the Business Class Studio on the A380. The First Class Suite is basically a standard sized First Class seat which just happens to have a door, which I never closed. The A380 First Class Apartment is something entirely different. 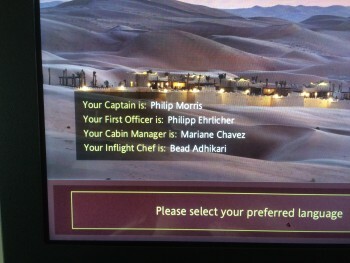 Etihad has a special part of its website devoted to the A380 First Class Apartment. When you enter the plane and turn left, this is what you see. First Class is situated in the nose on the top deck. You need to remember that this is a one-aisle cabin. 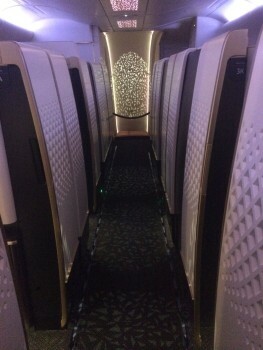 On an A380. Which is a very wide plane! There are nine First Class Apartments, four on the left and five on the right. The ‘Residence’, the small private apartment, is at the front on the left. There are two toilets, one of which includes a shower, on the right. When I walked into the suite, I genuinely went ‘wow’ in my head (the words may even have have popped out!). In terms of, well, ‘wow factor’ this is is. 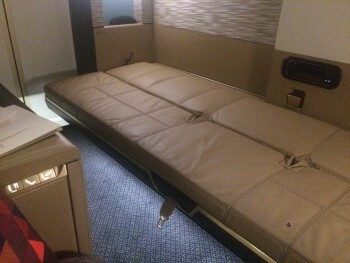 There is no other First Class product that comes close, the nearest is probably the the Singapore Airlines First Class Suite which I reviewed here. We are talking about a suite which could easily seat six people. Easily. OK, it would be a bit like sitting on the back row of the bus, but you get the point! The washbag you see in that photo is empty. Interestingly, Etihad has decided not to win you over with luxury branded toiletries – Qatar, as you will see in a few days, gave me a bag of Armani products whilst Singapore Airlines has a deal with Ferragamo. You can just see in the picture that there are some small-brand toiletry items in the sides of the mirror – you are meant to fill your bag with any that you want. I ended up leaving the bag behind and just taking a toothbrush and toothpaste. I was also given a sleep suit, even though it was a day flight, which I used as pyjamas in the hotel! Obviously this is a stunning space to have to yourself for seven hours and only a curmudgeon would find something to complain about. So I will, just to prove that nothing is ever ‘perfect’. The base of the seat slopes backwards. You can see this clearly in the 2nd photograph. This had unfortunate repercussions – when I sat down, all of my coins and my house key shot out of my trouser pocket and slid down a gap between the back of the seat and the cushion. There is no access to this area for the crew. We thought that I would have to wait in Abu Dhabi for a maintenance team to take the seat apart but we managed to reach through the mechanical parts of the seat and find the key. The money had rolled away but losing the key would have been a nightmare. Because of the gap between the seat and the sofa / bed, it is difficult to get comfy. Putting your feet on the sofa / bed is tricky because it is a long way away! The apartments have different layouts to maximise use of space. In mine, as you can see in the picture, I had no view of the window when seated. I was facing forwards. The row behind me faced backwards but the seat was next to the window. The row behind that had both a seat by the window and faced forward. I moved to that row after take off. The light level is very, very low indeed. With a 2pm departure, it was dark outside within an hour of take-off. To all intents and purposes, this is a night flight in Winter! Even with the very few apartment lights all turned on, I was struggling to read. On long haul flights, reading is what I tend to do. As usual, I ignored the onboard wi-fi and I ignored the in-flight entertainment and worked my way through a week or so of books and magazines that had built up at home. Don’t take my complaints above too seriously. This is a stunning space – I felt a bit sad that I was on my own, to be honest. It is almost embarrassing to compare it to the standard British Airways First Class seat. Since the Etihad devaluation, this has become a more expensive miles redemption via Etihad Guest. When I booked it was 55,000 miles one-way from London to Abu Dhabi, which included chauffeur transfers at each end. It will now cost you almost 88,000 miles each way plus the new fuel surcharge. This is still astounding value compared to using 80,000 Avios for British Airways First Class one way, with no chauffeur service! A better deal, as long as you book before the March 2016 devaluation, is using American Airlines miles. You only need 40,000 AA miles to book the First Class Apartment from London to Abu Dhabi one way. You don’t even pay the fuel surcharge when using AA miles and availability is identical to booking via Etihad Guest. You could buy the AA miles you need for a modest sum via their current promotion. Tomorrow I will continue my review of the Etihad A380 First Class Apartment with a look at the food and drink on board. PS. Since I know someone will ask, this is what the inside of the shower looks like. I did not partake …. My review of the InterContinental Abu Dhabi hotel - it is good news and bad news! Booked our LHR-AUH just before the devaluation using Etihad Miles. Looking forward to it next year. If you need to sit next to window or flying with a partner, 3A/4A and 3K/4K are best options since they are the only ones with the sliding door which open part way so you can sleep looking at each other, not quite the same as the ‘double’ bed on Singapore. Look forward to the next installation on food since wondering if they have introduced caviar yet!!! No they haven’t – same weird menu as I had in February so I had to get the chef to knock up something for me! Off topic – I have just received my 250 Aer Club avios bonus in avios.com! Looks fab, but I still would not detour via LHR to fly it when I can go direct from EDI. However, I hope they will deploy aa a380 to one or more of my Asian destinations once they receive further deliveries. You know what …. I would do. Because you can. The 2pm A380 works fine for an EDI connection too! The only flight I’m in the market for at the moment is BKK-EDI in October as I’m already fixed until then. So, I would need the flight in reverse. Also, would need to commit to it as my only way of funding it would be via purchase of AA miles now. Interestingly though the price at first glance does not look that much greater than my equivalent cost of CW with avios and this makes CW look like economy if we are honest. Doesn’t that screw you a bit for lounges? No lounge in EDI. And return, no lounge in LHR? EY use No1 lounge in Edinburgh but usually I clear security about 30 minutes before departure anyway. In LHR if I recall there’s now (orgoinb to be) a plaza premium arrivals lounge landside at T4, not that that helps much, and the new lounges at T5. An amazing review of an amazing product, thanks. Um, some wallets don’t have a coins compartment…And most men don’t carry bags with them, generally, so it’s a habit to keep them in your trouser pocket, even if you are flying. I have one key. That’s it. No key ring, just a key. Sits fine in my trousers! Hi..I have read on this blog that Etihad keep swapping around their planes.. out of the 3 flights per day from LHR..is there any particular one which has maximum chances of being an A380? Is this temporary? i.e has Etihad announced when they would be shifting back to an all A380 service from LHR? The product looks great and would definitely like to try it in 2016 as I have enough AA miles for a one way but I would be gutted if I don’t get an A380 !! Even though I am Etihad Gold, they would not move me to the A380 on the Tuesday because there were no reward seats showing. There is nothing you can do about this unfortunately. I used to think that Qatar was terrible at this (and they still are) but Etihad was more reliable – that is no longer true. Ok thanks. So looks like a game of ‘A380 roulette’!! So I guess I will be booking, praying and following up on the flight app you mentioned to manage my expectations in case of a plane change !! So was mine, I must have got lucky as I had no status and they ‘opened’ up a seat for me on a flight that had all 9 F apartments takes (inc me). It was pretty busy! One day. One day !!!!! I had two (highly enjoyable!) flights in the apartments in August, and then they were using Le Labo toiletries. Have they gone white-label since then? The (very small) lip balm and moisturiser were branded – just not with a name I recognised. It may well have been a well regarded niche brand, like REN, but it was not something I had seen before in any shop, hotel or airline bag. Qatar and Singapore like to ‘make a point’ by giving you big bottles of super-branded stuff. The 30ml bottle of Armani EDT will last about 3 months and, of course, whenever you use it you remember where it came from. Even the Armani shower gel Qatar gave me was pretty big – it is still going strong in our house two weeks on! Sorry to ask the childlike question, but what steps do you have to go through to book this using AA miles but from LHR? What if I then want to go on to Australia, or even New Zealand? About loose coins, I use empty 35mm film canisters (remember them?). OK, I don’t use film now, but I have been storing remaining USD, EUR, ZAR and some other coins for a number of years. And use the canisters when going through ‘security’. Now – Lord Sniffy here – I could never understand the attraction of spending leisure time in Dubai or Abu Dhabi. As somebody who just remembers Dubai Creek before the concrete infestation and who visited the IC Abu Dhabi during its soft opening (and who still has a theoretical free weekend offer of a free weekend there to make up for shortcomings), I thought the attraction was zilch. However, thanks to Rob, I see a Concorde-style opportunity. Our Concorde flights remain our unique flight experiences. Mrs Roger and I seem to have enough AA miles to book return flights to AUH in the Apartments if we hurry. I agree 100% having worked out there – zero attraction in itself unless you are a hotel & pool junkie somewhere warm & humid, esp if you are teetotal lol – but actually visiting the rellies might be an influential factor, safe enough place for the kids etc. I prefer a little local colour & culture/ history/ cuisine. I prefer a huge water park, fantastic kids club, guaranteed sunshine and free wine and beer for 2 hours a day. What’s not to like!!!! Ive done all the culture, history etc and my kids would be very bored…..they don’t get bored on the leap of faith! Snap. I detest the likes of Dubai. Unless of course you just want to sit by a boring hotel pool. Or go to malls (which some people do)……I say stay at home & enjoy Trafford Centre or Westfield! OT: Interesting series on Spain you may want to watch, was on BBC cultural channel this week, with Simon Sebag Montefiore, Blood and Gold. Very slightly OT, I have 50k ethiad miles from the sign up bonus plus some spend, how much would the remaining AA miles cost to fly my wife and son to AUH in the current sale? Do you think that it is even possible to book one j seat through etihad and 2 through AA for the return and use avios and a BA 241 to get out there? Which other routes do they fly this on? Would love to fly it, but wife not keen on Middle East! Is it only me that’s wondering how many children may be conceived in these ‘apartments’? 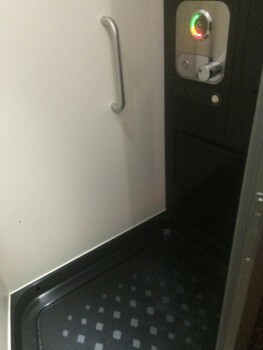 I experienced the F apartment late Nov from LHR-AUH and return. It was full on the way out and only 2 of us on the return. Weirdly, the service was better when it was full as they were up and down the cabin all the time attending to all our needs. The food was amazing and the bed great, a little firm but I like that. I actually booked 4A which is a forward facing window seat and you have 3 windows. I was very pleased with it but before we departed, I was asked to move to another seat to allow a couple to share the ‘double’ bed area with row 3 and 4. As I was on my own, I didn’t mind moving and they were very grateful. I did come off worse though as row 5 should be avoided. Rear facing seats and aisle ones too with only one window!! I took a shower which was a novelty but very nice. The return flight 4 days later had the same crew and they remembered my name which I thought was a nice touch. And they thanked me again for moving seat! They even gave me an extra amenity kit for my wife who wasn’t even travelling to say thank you. This time though, they didn’t wander through the cabin much and it took me a while to realise that if I wanted anything, I should press the call button. I hesitated for so long about this as I just felt rude pressing it but that’s what they wanted. They leave you to it but happy to help whenever. Disappointingly the shower wasn’t working on the way back but that wasn’t fault of the crew. They wouldn’t let me use the residence shower! The most amazing bit was the deplaning. They ensure F pax leave the aircraft first, so I was first off. Straight through security at Heathrow, and my bag was already there off the carousel in a roped off bit – random! Then walked outside and the chauffeur was holding a sign with my name on it, whisked me to his BMW 7 series and off I went home. From aircraft door opening to being on the M25 in less than 20mins! Very impressive. Thoroughly enjoyed the experience – the only thing I wouldn’t recommend is the back massage in the spa! I’ll save that story for another time….! the words ‘massage’ followed by ‘story’ – bit creepy…..
She pressed so hard with her elbows into my back…I accidentally farted! I don’t remember a time in my life being more embarrassed! That did make me laugh out loud! Can’t believe you just confessed to that! Haha I know – funny now but a tad awkward at the time! Maybe HfP should have an end of year funnies thread. Post your most embarrassing moment of the year. Mine was only last week. Lying in the dentist chair, I sat up to rinse my mouth and realised my fly was down. I was gutted!